CSC Services have completed many installations of machine grouting to power stations across the UK. 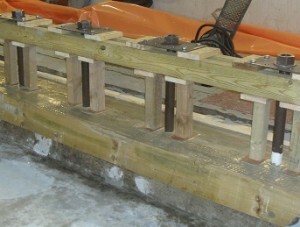 With a 100% success rate CSC Services are proud of our machine grouting work. We are able to apply our knowledge and and specialist experience to each application for our clients. Machine grouting or base plate grouting is a relatively cheap way of making a solid connection between any machine and the foundation beneath it. The correct grout selection and formwork are key to a good installation. When machine grouting, the applied load of the machinery or base plate must be taken into account when selecting the correct grout for the job as exceeding the bearing capacity of the grout may cause catastrophic failure or at the very least severe cracking to the grout base. The compressive strengths of grouts are determined under laboratory conditions. It is good practice when selecting a grout to remember this as on site cured values may be 20% less. In choosing the correct grout, information on the machinery to be installed is essential as most cement grouts cannot tolerate vibrating machinery or constant impact. CSC Services recently performed machine grouting repair work at Dungeness Nuclear Power Stations for EDF Energy as part of outage works.